Chart No. 28 - The Three Poles of the Diaphragm in Its Respiratory Mechanism and Contact Areas to Influence It Anteriorly and Posteriorly. Many chronic pains under the shoulder blade are a direct reflex from the lower abdominal region and can be released there. This reflex can be from the ileocaecal [ileocecal] valve, the gall bladder, or the ampulla of vater [hepatopancreatic ampulla], the sigmoid, etc. The current usually crosses over to the opposite shoulder and registers as a pain under it. Fig. 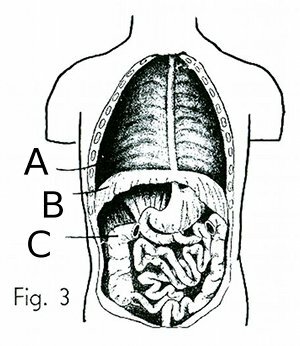 1 shows the anterior view of the three poles of the diaphragm. The lower or negative pole is divided into two lateral (dotted) triangles and a neuter [neutral] one in the middle. The subpositive pole is marked on each side along the heavy thigh muscles. The entire negative pole is an extension anteriorly of the perineal line over the thighs as the negative respiratory pole in running. 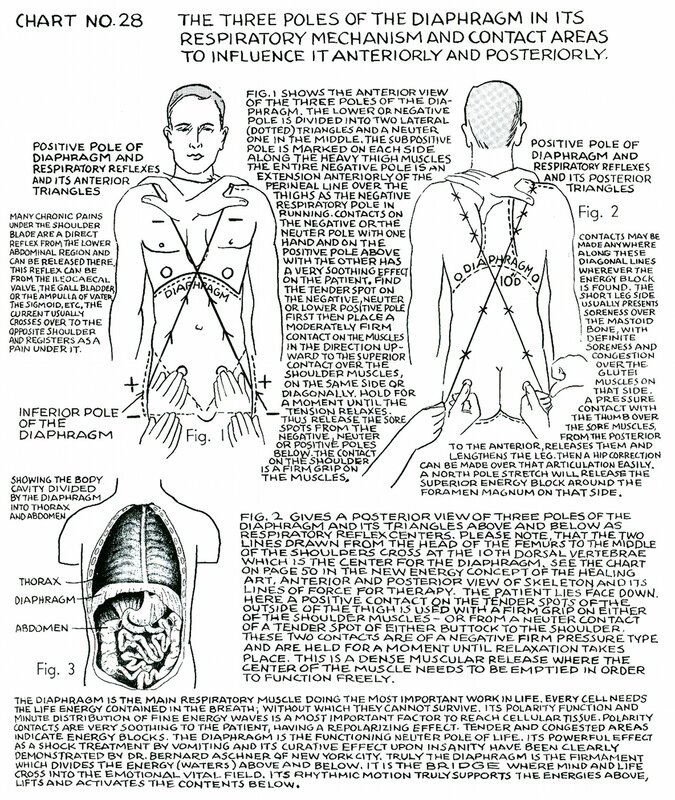 Contacts on the negative or the neuter [neutral] pole with one hand and on the positive pole above with the other has a very soothing effect on the patient. Find the tender spot on the negative, neuter [neutral] or lower positive pole first then place a moderately firm contact on the muscles in the direction upward to the superior contact over the shoulder muscles, on the same side or diagonally. Hold for a moment until the tension relaxes. Thus release the sore spots from the negative, neuter [neutral] or positive poles below. The contact on the shoulder is a firm grip on the muscles. Contacts may be made anywhere along these diagonal lines wherever the energy block is found. The short leg side usually presents soreness over the mastoid bone, with definite soreness and congestion over the glutei muscles on that side. A pressure contact with the thumb over the sore muscles, from the posterior to the anterior, releases them and lengthens the leg. Then a hip correction can be made over that articulation easily. A North Pole Stretch will release the superior energy block around the foramen magnum on that side. Fig. 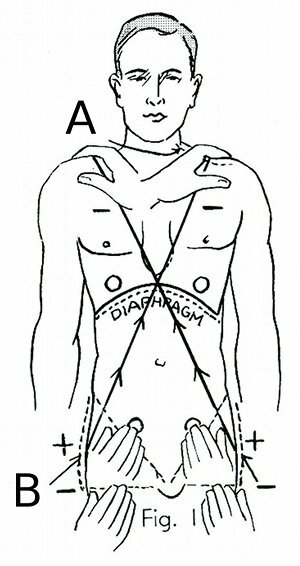 2 gives a posterior view of three poles of the diaphragm and its triangles above and below as respiratory reflex centers. 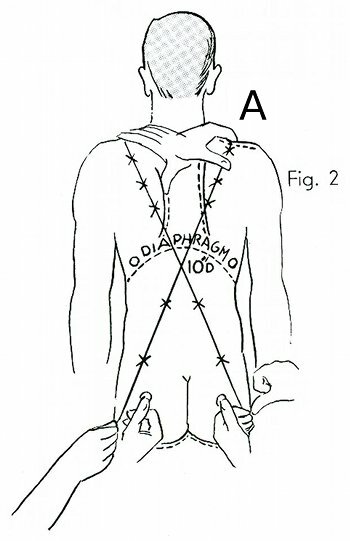 Please note, that the two lines drawn from the head of the femurs to the middle of the shoulders cross at the 10th dorsal [tenth thoracic, T10] vertebrae [vertebra] which is the center for the diaphragm. 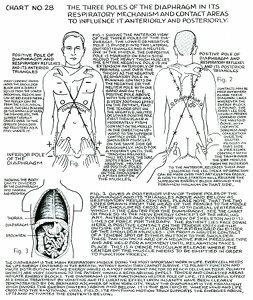 See the chart on page 50 in "The New Energy Concept of the Healing Art", Anterior and Posterior View of Skeleton and Its Lines of Force for Therapy. The patient lies face down. Here a positive contact on the tender spots of the outside of the thigh is used with a firm grip on either of the shoulder muscles - or from a neuter [neutral] contact of a tender spot of either buttock to the shoulder. These two contacts are of a negative firm pressure type and are held for a moment until relaxation takes place. This is a dense muscular release where the center of the muscle needs to be emptied in order to function freely. The diaphragm is the main respiratory muscle doing the most important work in life. Every cell needs the life energy contained in the breath; without which they cannot survive. Its polarity function and minute distribution of fine energy waves is a most important factor to reach cellular tissue. Polarity contacts are very soothing to the patient, having a repolarizing effect. Tender and congested areas indicate energy blocks. The diaphragm is the functioning neuter [neutral] pole of life. Its powerful effect as a shock treatment by vomiting and its curative effect upon insanity have been clearly demonstrated by Dr. Bernard Aschner of New York City. Truly the diaphragm is the firmament which divides the energy (waters) above and below. It is the bridge where mind and life cross into the emotional vital field. Its rhythmic motion truly supports the energies above, lifts and activates the contents below. 1 In The Complete Collected Works, Charts 6 and 7, pages 76-80 of Book 1. 2 Dr. Bernhard Aschner (1883-1960), a Austrian physician and physiologist. He was a pioneer in the science of endocrinology and a medical historian.